The following is a list of advertisements that involve or invoke the Mario franchise, but are not for Mario products. For a list of advertisements for the Mario franchise, see List of Mario advertisements instead. These advertisements may be on television, other forms of public broadcast, or in print media such as posters and magazines. 15 West Ham United F.C. The retouched Bowser artwork is on the bottom right of the package above the soccer player. 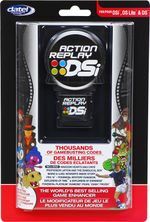 The packaging of the Action Replay DSi depicts numerous video game characters, including an altered version of Bowser's Mario & Luigi: Partners in Time artwork that makes him primarily green and olive yellow, with a spikeless red shell, light brown eyes and hair, a different hairdo, downward-curling horns and silver bracers inlaid with red gems. The advertisement showing two children using the shoes to jump and reach a coin. Throughout 2016, Canguro scarpe (meaning "Kangaroo shoes") have broadcasted an Italian advertisement for childrens shoes, showing two children playing a gaming console on a television set in their family home. The television's screen shows animated children within an Acorn Plains-like level in New Super Mario Bros. U, with colored platforms and a background resembling the one seen in Yoshi Hill. The children's ability to jump high and reach a coin within the level is exaggerated by the bright colored Canguro-branded shoes that they are wearing. The game's appearance in the ad. In 2015, Super Mario Bros. is referenced in the Cheerios Game On advertisement. A TV advertisement for the original Crash Bandicoot game features a man in a Crash Bandicoot costume yelling through a megaphone at Nintendo of America's headquarters. Among the lines he says are, "Hey, plumber boy, mustache man, your worst nightmare has arrived". A magazine advertisement for the game Croc: Legend of the Gobbos shows the main character, Croc, using a toothpick after having presumably eaten several other characters, whose various accessories are shown lying in front of them; one of these objects is a red had with an "N" on it, in reference to Mario's red cap. Mario appears in a Got Milk? commercial. In the commercial, two kids are playing Super Mario 64 and trying but failing to jump across a set of blocks from the level Wet-Dry World. After the kids leave, Mario then jumps out of the television screen and interacts with various objects in the house (including a soccer ball and a green object of some sort) before being flung by a skateboard inside the house's refrigerator, where he drinks a large swig of milk, causing him to power up and grow a considerable amount in size. Mario then leaves the refrigerator and jumps all the way back into the game, where he is much larger thanks to the calcium-filled milk helping his bones grow and is shown to be able to easily climb the set of blocks like stairs. 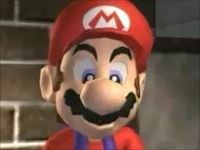 Despite showing gameplay of Super Mario 64, the commercial does not use actual in-game footage, as evident by the smoothness of Mario's model and the animation of Mario hitting the wall (which is not an animation that is present in the actual game). The music is also not actual music from the game, possibly due to copyright-related reasons. Mario appears in a Growth Spurt commercial, promoting the iPhone XS and its larger variant. Mario grows bigger and runs through Brick Blocks and Goombas, similar to Mega Mario. The jobsintown advertisement. When the tagline is translated, it means "Life is too short for the wrong job." 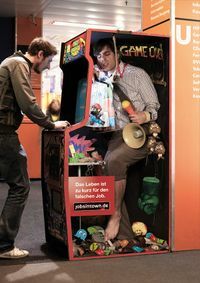 The German job search website jobsintown.de released a series of advertisements featuring various people uncomfortably working "inside" of automated machines, such as ATMs and vending machines. 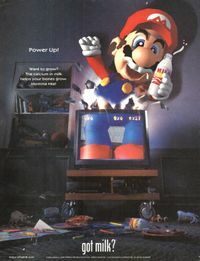 One advertisement with an arcade machine contained a few references to video games, including lookalikes of Mario, some Goombas, and the Ghosts from the Pac-Man series. A TV commercial for Kellogg's Froot Loops involves a man and his wife sitting at a couch after their kids are asleep. After the wife pulls out a box of Froot Loops, the two share a bowl of it while playing Super Mario Bros. on an NES together. A small caption on the bottom of the advertisement states that Super Mario Bros. is available to download on the Nintendo eShop. Mario is depicted in a Kraft Macaroni and Cheese commercial. Mario, Ronald McDonald and Grimace sharing a Happy Meal. The McDonalds commercial "Archenemies", showing Mario making peace with Bowser. In the McDonald's TV commercial "Archenemies," numerous different arch enemies are seen setting their differences aside over various McDonald's foods. Among them are Mario and Bowser. In the commercial, Mario makes amends to Bowser by giving him a potted Piranha Plant. A 1989 ad for McDonalds' "Happy Meals", showcasing Super Mario Bros. 3-themed toys, features the characters Mario alongside Ronald McDonald and Grimace in the Mushroom Kingdom. A TV advertisement for the original Sonic the Hedgehog and the Sega Genesis compares them to Super Mario World on the Super Nintendo Entertainment System, boasting that the package deal was "faster" and $50 less expensive than Nintendo's product. Despite the salesman's best efforts to flog Super Mario World, the kid from whose POV the commercial is shown is drawn to the TV showing the Sonic footage over the Mario screen and insists on buying it and the Genesis. A similar TV advertisement shows a woman ranting on Sonic the Hedgehog, eventually asking "Why can't he be more like that nice boy, Mario?" One year later, Sega would make a now-infamous commercial boasting that the Genesis had "blast processing", whereas the SNES didn't. As a show of what blast processing supposedly did, a drag racer with a TV screen strapped to it raced down a drag strip; the TV didn't show any footage, but scenes from various Sega games, including the then-new Sonic 2, were shown as the car drove past. As a show of what happened if one did not have blast processing, a beat-up minivan, also with a TV strapped to it, barely putted down the same track; the TV showed Super Mario Kart. In a 2017 Christmas commercial, Mario and Cappy are shown helping a family get their home ready for the holidays alongside several other characters from non-Nintendo series. To celebrate football player João Mário being loaned to West Ham United F.C., a short promotional video was released concurrently on Facebook, Twitter, and YouTube. Featuring graphics that are based on those of Super Mario Bros., the video shows Mário coming out of a Warp Pipe and hitting a ? Block, with a soccer ball appearing and bouncing away. A hashtag then appears, designed to look like Super Mario Bros.'s title screen, and Mário then runs off after the soccer ball. The sprite used for Mário, however, resembles Mega Man's classic sprite more so than Mario's. ↑ "Cangurokids - Arnetta srl - Via Pompei, 8". (September 15, 2016). Cangurokids - Spot TV. YouTube. Retrieved October 11, 2016. ↑ Tan, Dorothy (July 19, 2013). Brilliant Print Ads Show How ‘Life’s Too Short For The Wrong Job’. DesignTaxi. Retrieved March 10, 2017. ↑ "HKD2". (December 3, 2008). Captain Lou Albano - WGBS Philly 57 "Just Say No" Drugs PSA. YouTube. Retrieved February 28, 2016. ↑ "AdvertLand". (July 1, 2014). "TV Spot - Froot Loops - Bring Back The Awesome - Follow your Nose".YouTube. Retrieved October 13, 2016. This page was last edited on April 2, 2019, at 12:47.